See them mashed before you. It has been a long time since I’ve done a straight-up, full-strength American IPA (January, in fact). 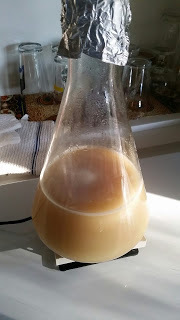 I’ve also been itching to try out some new yeast strains, particularly after hearing good things about “Conan.” I found the Vermont ale yeast via Yeast Bay, which is supposed to be just that. Most local shops don’t carry it, so I mail-ordered and planned out my brew. The name for this batch honors its ingredients’ roots spanning North America and Europe. This batch is aiming to be an “East Coast” style IPA, with a little more malt character as well as an interesting yeast. So, I designed a recipe that had Maris Otter and Vienna as its backbone, with a bit of Belgian Caravienne to round things out and some pale chocolate malt for color. I’ve been doing a lot of ultra citrusy-type hops lately (especially Citra), and I worry that they would clash with the malts and yeast, so I’ve switched things up a touch. The bittering hops are all Columbus, with an aroma/flavor addition of Cascade. I plan to dry hop with Simco and Galaxy. I mashed in with 5 gallons of water at 165°, to hit a mash temperature of 151°. The mash was down to 150° after 30 minutes, and 147° after 60 minutes. After 60 minutes, I added 0.5 gallons of water at 180°, let rest for 10 minutes, vorlaufed, and drained the mash tun to collect 3.25 gallons of wort. Next, I added 3.75 gallons of water at 185°, which raised the overall mash temperature to 165°. I let it rest for 10 minutes, vorlaufed, and collected the remainder of the wort. All together, I collected 6.8 gallons of wort with a gravity of 1.053. This translates to a mash efficiency of 73%, nearly exactly on the nose for my calculations. I brought the wort to a boil, and added the bittering charge. After 50 minutes, I added the Whirlfloc tablet. After 55 minutes of boiling total, I added the additional Columbus and an ounce of Cascade hops. At flame-out, I removed the Columbus hops and added the remainder of the Cascade hops, to steep while I chilled the wort. I chilled the wort down to 80°, transferred it to the fermenter, and pitched the yeast starter. Approximately 5.5 gallons of wort went into the primary. The starting gravity for this beer is 1.064, exactly where calculated by my software. I’ll ferment this at 68° for two weeks (perhaps with a slight temperature increase at the end to maximize attenuation, as suggested by Yeast Bay). I brewed this beer on November 23, 2015. This entry was posted in India Pale Ale, IPA and tagged TIPA, Transatlantic IPA. Bookmark the permalink.